Real silence can be a strange experience for some people. Even when alone, they seek to fill it with noise – television, or music, or simply their own voice – they can never really enjoy the silence. Perhaps they find it uncomfortable, or empty. My children are in another part of the house, playing with LEGO I believe, and I can sit here at my desk, watching the massive bumblebees launch themselves at the flowers in the garden, and at the glass in the window panes, and just enjoy the small, ambient noises of the world waking up, the loudest sound right now is the click of my keyboard as I type. If ever I want to, I can remove or turn off my hearing aids, immerse myself in almost total silence on a whim. Just for the peace it brings me. I went swimming yesterday, in the ocean, in the rain. I cannot wear my hearing aids in the water, so I must always swim in almost complete silence. That combination, it was a life’s first for me, and was absolutely amazing. It occurred to me, swaying and drifting in the water, that I never really truly felt like I belonged anywhere in the UK, even in Whitby, where I was born and grew up. Here, and now, feels like I am exactly where I should be. I don’t sometimes feel displaced because I am not from here, I sometimes feel displaced because I feel like I should have been here many years ago and I am only just catching up with myself. That realisation, although completely wonderful, also slightly scares me, because sometimes it doesn’t feel real, or maybe it even feels too real. The author, William Gibson, talks about jet lag being your soul catching up with your body, and sometimes it can feel like I have simply been experiencing an extremely long period of jet lag. It is not tied necessarily to my physical space, however, it is linked more to how I feel and who I am now. I was born 12,000 miles away from here, and yet equally I was born right here, because here is where I have found myself. It wouldn’t have mattered where in the world we had ended up, it was the process, the journey that was important. I needed that shake-up, that complete change, to pull me out of stagnation and see what was real. I have an Old Life and a New Life. I know I got on an aeroplane, and I know I travelled here, but sometimes the only way I can remember it is if I look at pictures, the disconnect can be so strong. Perhaps that is a good thing. Perhaps it is New Life papering over the cracks of the Old and allowing me that fresh page. Sometimes I feel like I have been brought here for a reason, that the sea has brought me here, and it might be a while before that reason is revealed to me. Perhaps I am only a passage, a vessel for my children, or for my children’s children, my reason is only a stepping stone. For now, though, I am simply happy to be here. I have found it a very important and enlightening process with regards to fitting in and settling here, to research the culture and ancestry of New Zealand. 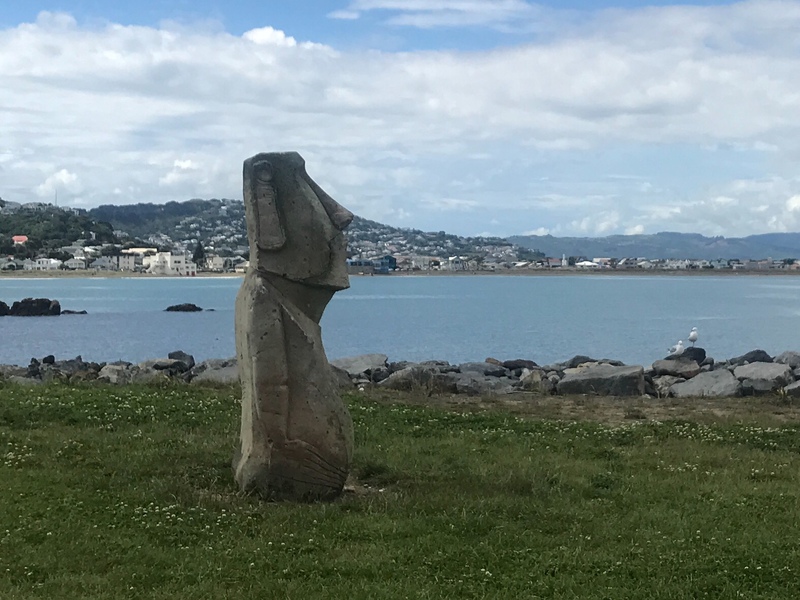 I understand that this emotional relationship with certain places is what Māori call tūrangawaewae – places where they feel a strong, spiritual connection to the land. It is connected to their Iwi – their people. I am not Maori, I am not even properly Pakehā, my ancestry comes from the Celts and possibly the Norse. I cannot, and do not want to, claim such a feeling, but I think maybe I do understand a little of what it can mean to them, and I think I can feel the energy of the land. How that energy rises up and reveals itself. It is an understanding and appreciation of how the land is precious and sacred, and that nature, and what it gives us, should be respected. To Māori I believe it means kinship and a right to stand in such a place – it is land where they feel empowered and connected to their Iwi. It is their foundation, their place in the world, and their home. It is a beautiful thing. Please do forgive me and educate me if I have misinterpreted or misunderstood in any way. For me, a white woman, an outsider and what some might call tauiwi, I want to find a way of expressing how I feel without any appropriation. Right now I hope I can settle for “being” yet also acknowledging that I am here only on my merits, that I will always be walking on borrowed land, and that is how it should be. So, back to the silence. I think the two loudest sounds here are the wind and the sea, although obviously the sea is only truly loud when you are close to it, while the wind comes around your house, knocking on windows and rattling doors, demanding to be acknowledged. Wind is obnoxious, even on a calm day. It has many forms, but it always feels like the most intrusive of the elements. With other forms of weather there are ways to avoid it or hide from it, but wind seems absolutely determined to find you. “Hi! Hello! I’m here again!” It seems to say, as it grabs you by the ears with both hands and leans into your face. It can be like a demanding toddler, or a sedate old man. It can run and whoop and swirl, or it can meander and caress. Either way it seems impossible to hide from it completely. In that way it is the partner of the sea. Both are unstoppable and will do exactly as they wish. Both have great power and strength, the ability to ravage and destroy, but they can be equally calm and restful. They do as they like and have no consideration for what gets in their way. You must learn to accept them and work with them, or accept that you will always be fighting against them. A fight you will never win. Those two sounds, the wind and sea, serve to make Wellington the wild and wonderful place it is, and it makes it feel in many ways that the people who live here are forever skirting the edges of that wildness They know they must work with the elements, or the elements will make life so much more hard and less enjoyable. Not with malice or with any real intention, but because that’s just what they do. I feel like too many people fight the wind and the sea in their lives, perhaps without realising it. I know I did. They still believe that they can tame the elements without appreciating or understanding their immensity. They see the wind as a nuisance to be overcome, the sea a force to be tamed. That is not true. To wilfully ignore, or worse, challenge, these elements in your life, ultimately never ends well. Life does not, and should not, always have to be a battle. Here and now, I am not afraid of the wind or the sea, even though I am fully aware of the destruction they can cause. I prefer to celebrate how impressive they both are. The wind and the sea, they stop for no-one. Fighting them is pointless, embracing them is the only true way to acknowledge their strength. You can keep your calm days, give me instead the power of the wind and sea, the roar of both in my ears. A calm day may be beautiful; the sea, gentle, the wind, a mere kiss on the cheeks, but at any point the weather may change, and there is absolutely nothing you can do about that. Embrace the power and the wildness, or spend your days always railing against that which does not care about your emotions, your plans or your ambitions, and can flatten you without a thought. Yesterday, floating in the ocean as the rain spattered down on the waves, making rings and ripples in the water, I felt completely at peace. Without my hearing aids, I experienced almost complete silence, and yet somehow the sounds were there, in my head. I could feel them around me. I could feel that energy. I completely relaxed and was at one with the elements, allowing them to move me, in so many ways. In that moment, I felt like I did not ever want to get out of the water and rejoin the land again, that the sea could take me wherever it wanted. Then I remembered the danger, how the tide could so easily take me, and sweep me out to a place where I could not get back from, even if I wanted to. I swam back to the shore, grateful to feel the land underneath my feet again. Bookmark this article Of silence, the land, the wind and the sea. Beautifully expressed Tabby and I’m so happy for you.